CDM did a writeup about Baby Bots! Hey everyone! We are currently experiencing a high demand for Baby Bots, but will be finishing a new run of them soon. If you are interested in getting one, please contact us via the “Contact” page, or message us directly on social to be put on the list! The first of our Baby Bot Sound Visualizers are finished- Krystal, Mr. Fingers, Ghost Boy, and Magic Spike. Featuring awesome decorative accessories from Lab Monkey Number 9, they light up in response to sound via a small microphone inside, with a knob for adjusting the sensitivity. These ones are available to buy in the shop. 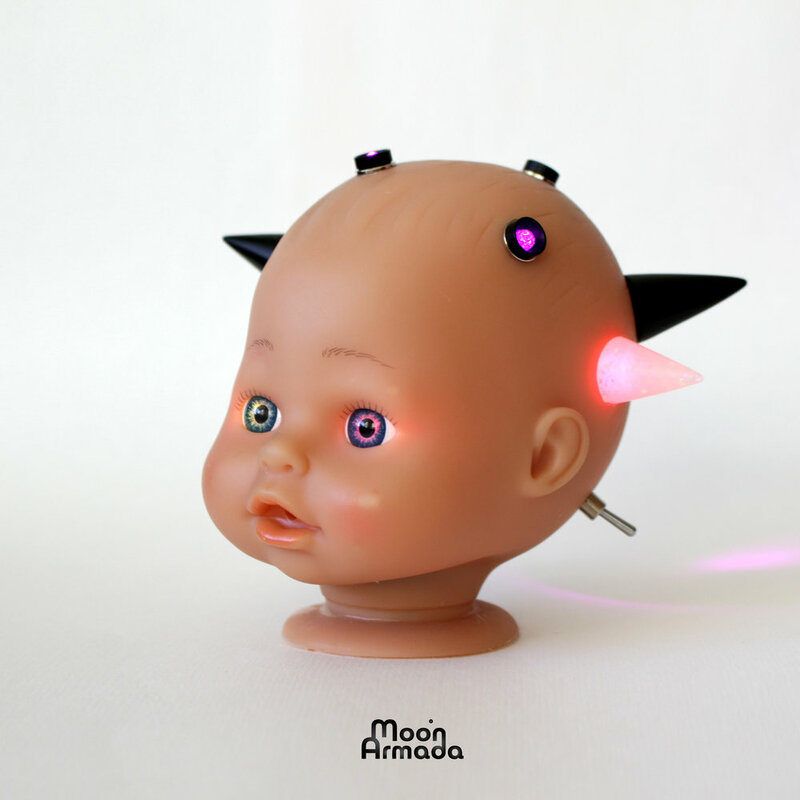 Come join us in Riga, Latvia September 21 -23 for the European Professional Doll Art Festival, where we will be showcasing some of our latest Baby Bots. Also, on Friday at 14:00, we will be presenting a discussion and demonstration/ performance. More info can be found here. Our wonderful graphic designer Appias Albina has released a series awesome Moon Armada-themed shirts, hoodies, tanks, prints, and more on her Threadless shop. Check it out here. The Dual-Spring Noise-Thing features 2 springs stretched across a board with contact mics mounted at the end of each. It can be played by strumming, striking, or plucking it, and is actually sensitive enough to pick up sound pressure waves, meaning it can be used as a lo-fi reverb as well. Happy New Year! We are working hard on a fresh batch of Baby Bots and Custom Gameboy DMGs. Stay tuned for more!